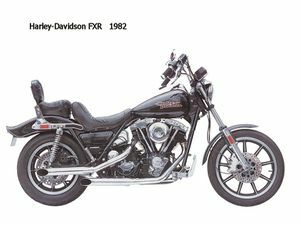 The Harley-Davidson FXR Super Glide II was introduced in 1982 and sold alongside the existing FX models. The FXR chassis was essentially an FLT Tour Glide chassis with lighter frame tubes and a more conventional design around the steering head. As such, it offered a rubber-mounted engine and a five-speed transmission, as opposed to the solid mounting and four-speed transmission of the original FX chassis. The 1984 Disc Glide as it was known was a very rare motorcycle it had the first offering of the "Chrome Package" meaning it came with chrome rocker boxes, nose cone, and primary cover. It was called the FXRSDG. This page was last edited on 24 November 2010, at 04:50.